Ever since Trump announced his candidacy, up has been down, black has been white, wrong has been right. 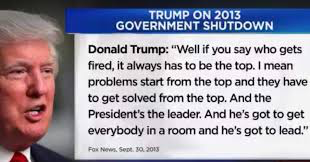 That trend continues as a man who is viewed by his supporters as a populist (seeking to represent the interests of ordinary people) obviously cares nothing about the 800,000 federal employees (about a quarter of all government employees) who are not being paid during this partial government shutdown. This Trump Shutdown is now in its 16th day and some 420,000 government employees designated as “essential” (in some cases, the lowest paid) are being forced to work without pay. The New York Times writes,“This includes upward of 41,000 law enforcement officials [including FBI and DEA], 54,000 Border Patrol agents, and 53,000 Transportation Security Administration (TSA) workers”. It can be no surprise that now some of those TSA employees have begun to call in sick in protest. According to CNN,“as many as 170 TSA employees called out [sick] each day this week” at New York’s JFK International Airport. At the Dallas-Fort Worth International Airport, “call outs have increased by 200%–300%.” And, union officials are predicting call-outs will increase when agents miss their first paycheck, forcing them to find other jobs to put food on the table, or pay their rent, or to stay home with their young children because they can no longer afford child care. What will happen is largely unknown though, since as TSA Administrator David Pekoske said, “We’ve never had a situation where officers did not get paid” since recent shutdowns have been of a duration that didn’t result in pay delay. This, in a job where the annual turnover rate at some airports is already as much as 80%. About half of TSA agents after all, make less than $40,000 per year,and I for one, can’t imagine these jobs are the most fulfilling, stressless ever created. And, even if there are plenty of people to backfill departing employees, the on-boarding and training of replacement employees must be incredible and the instability and uncertainty caused by this shutdown aren’t going to help. Options airports may use to keep lines down include fewer random pat down security checks on passengers, giving passengers who have not been vetted for the PreCheck program an expedited screening, or the use of a procedure called “positive passenger bag match” to loosen standards for checked baggage. No matter the reason for the shutdown, the American Federation of Government Employees (AFGE)says forcing employees to work without pay “is nothing short of inhumane” and has filed a lawsuit against the Trump administration. A previous such suit was filed during the 2013 shutdown and a federal judge finally ruled in 2017 that, “the government had to compensate 25,000 federal employees for damages due to the 2013 shutdown because it was a violation of the Fair Labor Standards Act to make workers do their jobs during the funding lapse.“ Those employees have yet to receive their damages compensation, but AFGE is hopeful that the precedence set will expedite matters this time around. Of course, federal employees aren’t the only workers in government that are affected by the shutdown. More than 40% of the federal government workforce in fact, are white- and blue-collar contract employees, and many of the latter, in lower wage jobs as janitors and security guards. These workers likely won’t ever be compensated for their lost wages. Likewise, small businesses that depend on the patronage of government employees (restaurants for example) won’t recoup the revenue they are losing. a statement rated true by Politifact. The costs incurred according to the center-right American Action Forum, include federal budgetary costs, forgone services, and economic disruption. The federal employees will after all, eventually receive their back pay; and there is cost associated with: shutting down and reopening offices, lost productivity, inability to collect permits and fees, and a lowered GDP growth (estimated at $2B to $6B for the 2013 shutdown.) And in 2013, we weren’t also paying for President ordered troops to the southern border to fight off the threat of a migrant caravan. The Pentagon estimated it would cost $72M to pay for the deployment through December 15, 2018. The administration is now considering an increased presence there until September 2019. We recognize when troops are being used as political pawns though, because we’ve seen it before, even on our homeland. As the Associated Presswrote last year, “When former presidents George W. Bush and Barack Obama deployed the Guard to the border in 2006 and 2010, they were pushing Congress to pass wide-ranging overhauls of immigration policy. Both overhauls failed. A 2011 government review estimated the Bush and Obama deployments cost at least $1.3 billion.